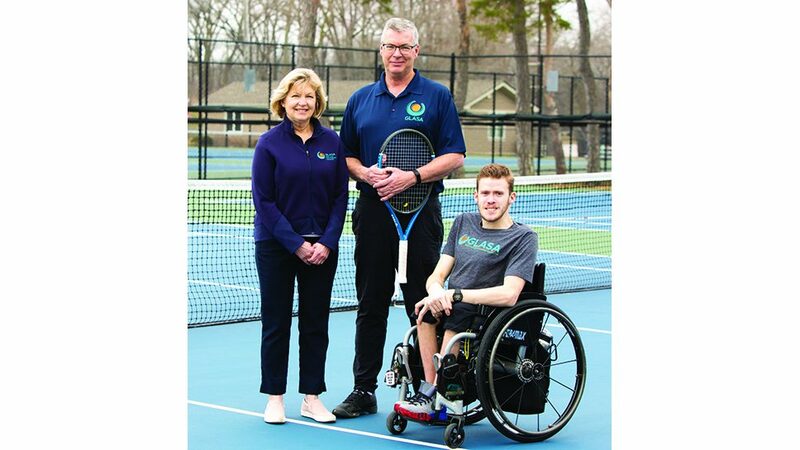 WINNETKA – Many teenagers babysit or mow lawns to earn extra money, but some students at New Trier Township High School have grander business ideas in mind. 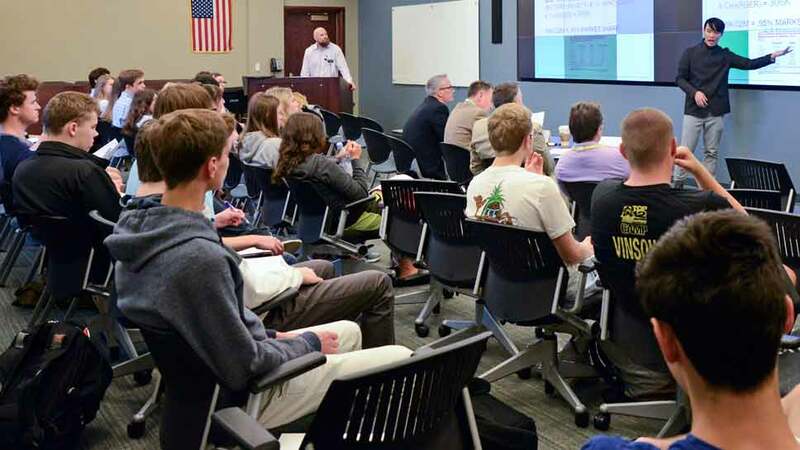 On May 10, students in an incubator business class called “Start Up U” had the opportunity to pitch their business ideas to a panel of judges. 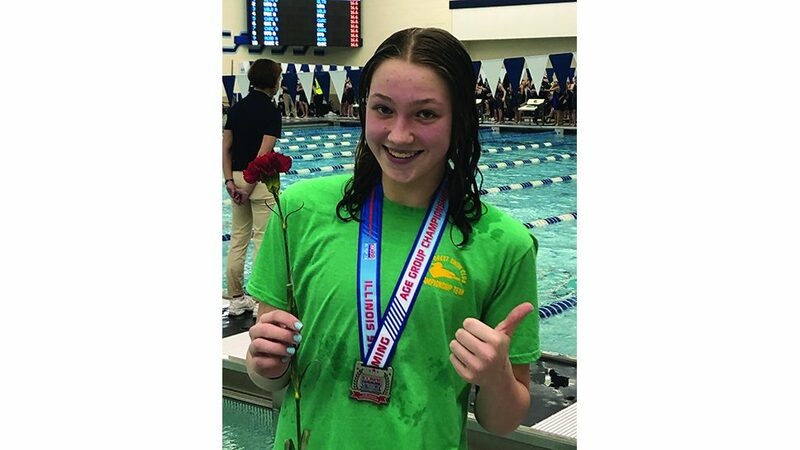 The top three teams will go on to compete against 24 teams from high schools all over Illinois and Indiana at an event hosted by Culver Academies. The winning team will receive $25,000 to launch a business idea. Students pitching their ideas were nervous about the challenge, but they found the experience rewarding. “It was super exciting. 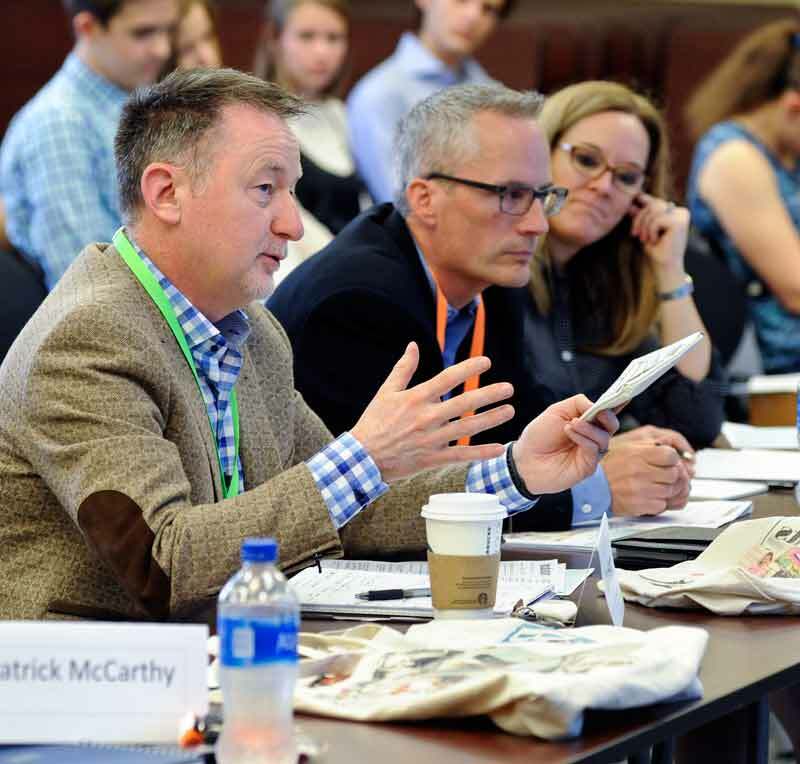 We got more enthusiastic about our company and its message when we knew were preparing for this event,” Talia Schacht, a sophomore at New Trier, told DailyNorthShore. Schacht was part of a team pitching a business that makes and sells uniquely designed tote bags decorated with scanned images from recycled magazines. The team already sells bags locally at The Black Sheep store in Glencoe, with plans to expand to more retailers on the North Shore and eventually across the country. All of the teams pitched their business ideas via a Power Point presentation, explaining their market, advertising strategies, projected revenues and strategy for growth. 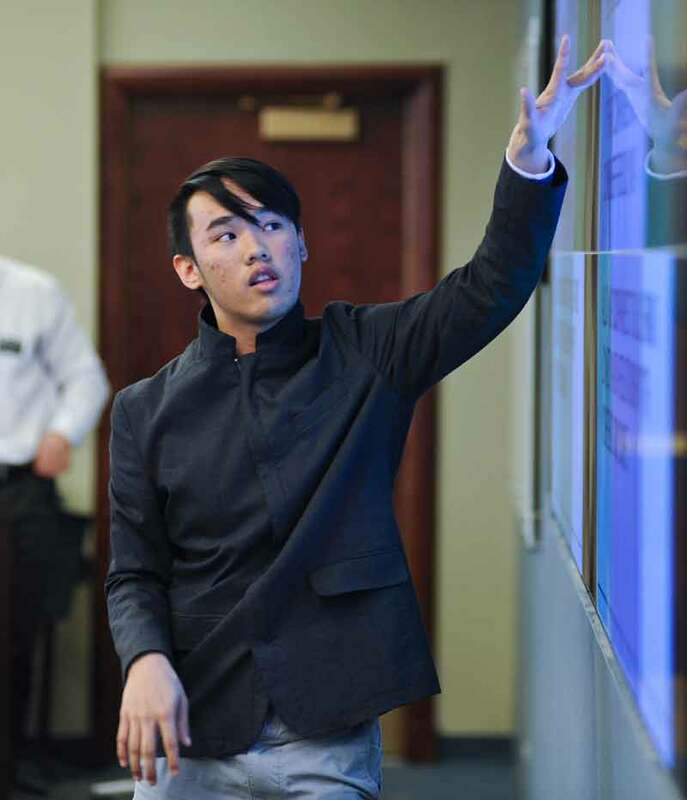 Brian Chung, who pitched the idea of an ePod – a recyclable smartphone charger – was chosen to compete at Culver Academies. Chung proposed selling the tchotchke at large venues such as music festivals, sport stadiums and theme parks, where people often need to recharge their phones. The ePod would have an advertiser’s logo on the outside. Chung’s presentation may have been persuasive, but the panel of judges comprised of business leaders, as well as New Trier Principal Denise Dubravec, didn’t let him off the hook easily. The judges pressed Chung to answer how he planned to compete with other businesses selling similar products, and what his plans were to ensure people would recycle the ePod, rather than just throw it away. Likewise, the team members pitching “Spark” — a smartphone app that offers a solution to New Trier’s parking problems similar to the app Spot Hero — were asked not only how they planned to compete with Spot Hero, but also how they would deal with potential liability issues. The Spark team will also go on to compete at Culver Academies. All of the student presenters remained calm and cool, answering each of the judges’ questions. They spent the school year preparing for this pitch, learning all the necessary steps of actually launching a business. Jacey Birkenmeyer and Gigi Picard, who pitched their business of soap-making from recycled coffee grounds, found the class to be a collaborative atmosphere where everyone supported one another. “I really appreciated the open-ended creativity of it,” Birkenmeyer said. Charlie Kendall — pitching Bakon Bites, a snack food that comes in four different flavors. Brian Chung stresses a point during his presentation at the New Trier Township High School’s “Start Up U” competition. Competition judge John Hearn asks questions of a student during a presentation. 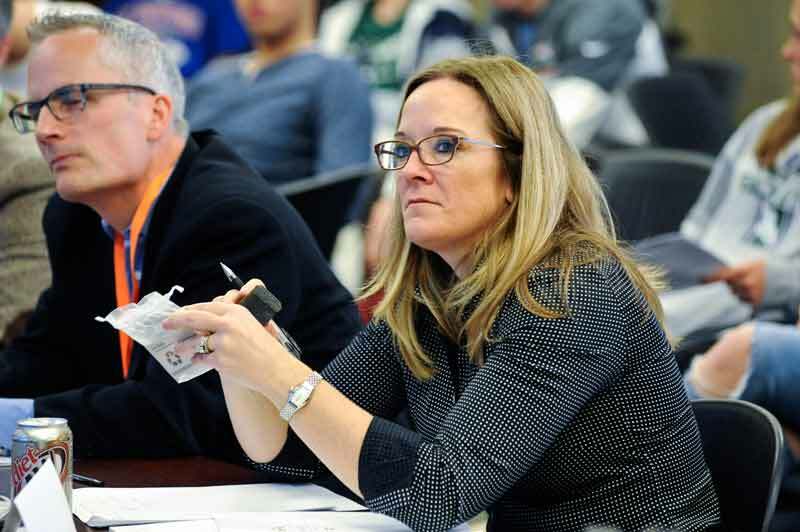 New Trier principal and Entrepreneurship Pitch Competition judge Denise Dubravec takes a closer look at a product submitted during a student presentation. 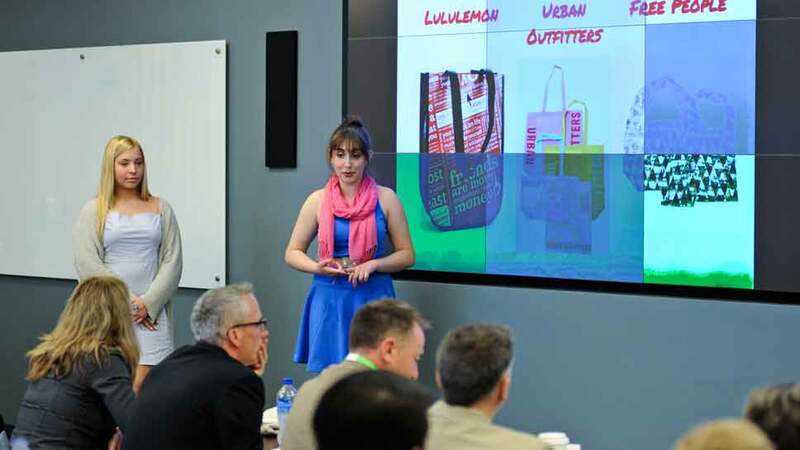 Co-presenters Maddie Sadovi, left, and Talia Schacht from “Bags by Sadovi” give their pitch to the judges.